Elsternwick is a residential suburb 9 km south-east of central Melbourne between bayside Elwood and Caulfield South. The name is derived from ‘elster’, the German word for magpie and the Anglo-Saxon ‘wick’ meaning village. Charles Ebden (the builder of Black Rock House, Black Rock, 1856), also had a house in the Elsternwick area, which it is thought he named Elster. 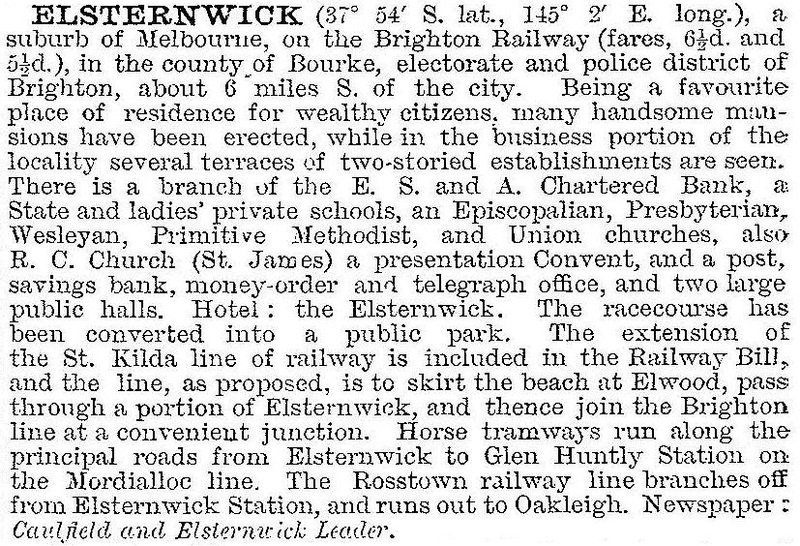 The name Elsternwick came into general use in the late 1850s. Elsternwick village was surveyed in 1856, situated on the Elster Creek, which later became the Elwood Canal. The village's location is partly occupied by today's Gardenvale. Elsternwick's western boundary is Hotham Street and the Nepean Highway. Elsternwick Park and primary school (1889) are west of the Highway. The suburb extends eastwards along the Glen Huntly Road shopping strip for about 1.5 km to Kooyong Road. The post office (1891) is on the Victorian Heritage Register. Elsternwick was situated astride three municipalities: Caulfield, Brighton and St Kilda. At the end of the 1880s attempts were unsuccessfully made for it to become a separate borough. It had a census population of 6790 in 1911. Elsternwick Park (Brighton) was mostly a swamp through which the Elster Creek (Elwood Drain), ran, and was used for horses, grazing and later recreation. The Elsternwick Golf Club moved from the reserve in 1925 to Kingston, but a public course was kept in the northern part and ovals formed in the remainder. The strip shopping centre along Glen Huntly Road became a strong retail location, and by the 1990s was ranked in the best ten in metropolitan Melbourne. Private schools were established: O'Neill College (Presentation Sisters, 1907), Cato College (Methodist Ladies/Wesley, 1930) and the Leiber Yaweh and Sholem Aleichem Colleges for the substantial Jewish population in the area. Immediately over Elsternwick's boundary on Glen Eira Road there are Caulfield Grammar School (1881) and Shelford Girls’ School. Hotham Street is the address of the heritage-listed Rippon Lea mansion and the adjacent ABC television studio. Elsternwick primary school had 598 pupils in 2014.